It's a Sindhi dish. 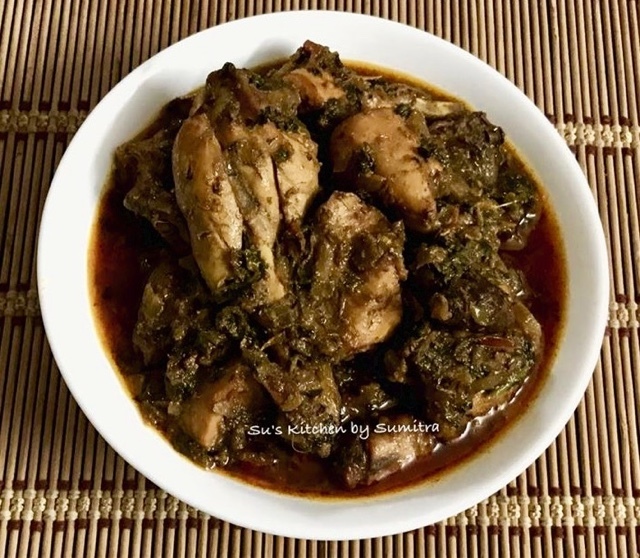 The chicken is slow cooked with lots of onion and spices. It's a semi dry curry dish. It's served for lunch or dinner. For a twist, I have added a handful of Spinach leaves. Heat the oil in a heavy bottom pot. Add onions, sauté the onions till it is brown in colour. Add the ginger and garlic paste. Sauté for a minute. Add the chicken and sauté it until the chicken changes it's colour. Add the powder spices and salt, stir once. Cover the pot and cook for 5 minutes. Add the tomatoes,spinach leaves, coriander leaves and green chillies. Stir and cook further till the chicken has cooked. In between add 1/4 cup of water. Serve it hot with pav or rice. 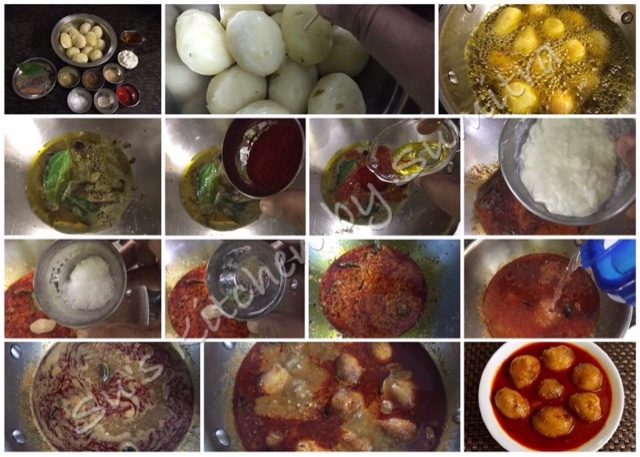 There are many variations of making Dum Aloo. Some of the different states in India has their unique way of making it. 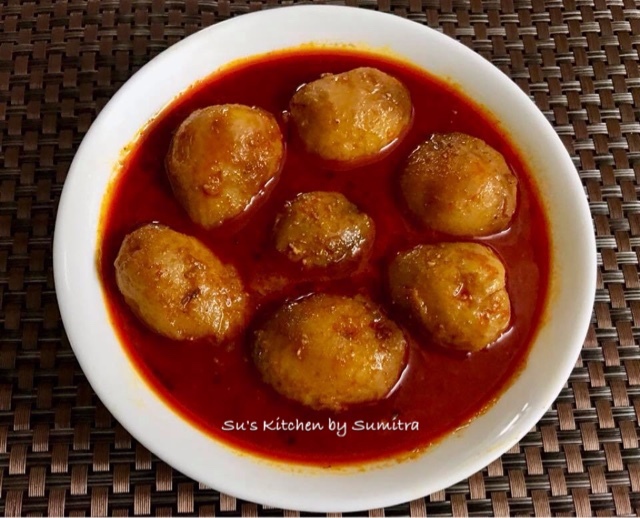 In Kashmir, the dum aloo looks rich and vibrant due to the Kashmiri chilli powder used in it, which gives colour to the dish. Apart from the colour, the dish is flavorful too, as the fennel seed powder and ginger powder is also used in it with the other spices. The medium size of potatoes are boiled and pricked with a tooth pick. It is deep fried in oil and then the gravy is made. 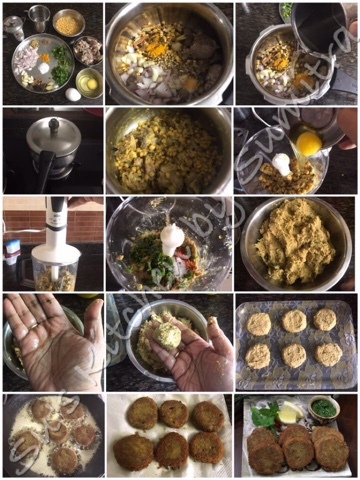 I was inspired by Chef Sanjay Raina's Dum Aloo Video and I had to make this dish which was in my bucket list. Prick the potatoes all over with a toothpick. Take the mustard oil in a wok. Heat the oil well till the smoking point. Reduce the heat and fry the potatoes well till golden brown in colour. Remove the potatoes from the oil and keep it on a paper towel. Remove the excess oil from the wok, leaving 2 to 3 tbsp oil in the wok. Add the whole spices and sauté it for 2 minutes. Add the red chilli powder into the wok and stir well on a low flame. Add 2 tbsp of water, so that the chilli will not burn. Add the curd and stir. Add all the spice powder and salt. Stir and cook all the ingredients together well till the oil separates from the masala. Add 1 1/2 cup of water. Let the gravy simmer for 2 minutes. Add the fried potatoes. Cover the wok and cook for 20 minutes till the gravy thickens a bit. Serve it hot with rice. Baking bread at home is a more healthier option rather than buying it from the store. 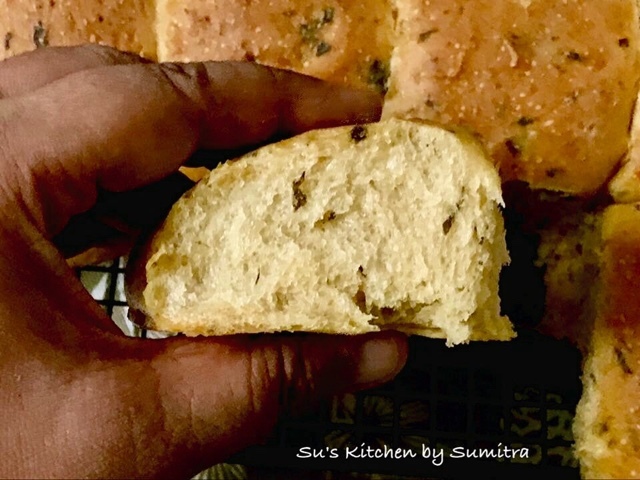 All of us are regularly kneading dough at home everyday to make rotis, chappaties or Paratha. But when it come to making bread with yeast we are a bit sceptical about it. Believe me, it's a very easy task. Only thing you have to keep in mind is that you have to give the dough time to rise. Proofing is very important. To make it more nutritious, you can add grated or chopped vegetables while kneading the dough. You can add spices as per your choice to make it more flavorful. 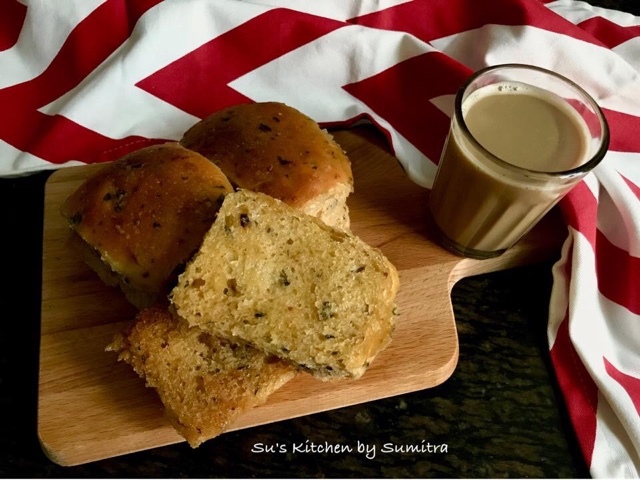 Serve it as snacks or eat it during breakfast with chai - maska or enjoy it with any side dish like egg omelette, keema or vegetables. Chop the garlic, spinach, Tomato and chillies. 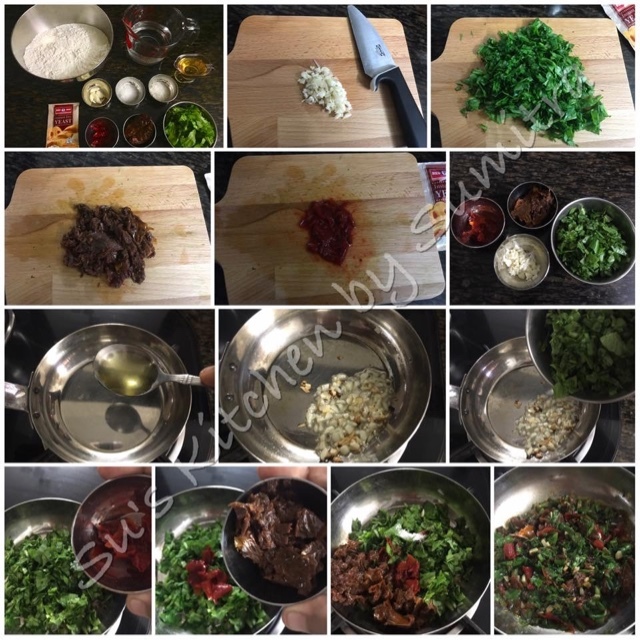 Take a pan, add 1 tbsp oil. Heat it. Add the garlic, sauté it for few seconds. Add the spinach, pickled tomatoes, chillies and salt. Stir and sauté till the water from the spinach has dried up. Take 1/4 cup lukewarm water, add sugar and yeast. Stir it and let it rise. Add the rest of the salt to the flour and mix it. Add the yeast water and the remaining water to the flour. Add the spinach mix and start to knead it. After 5 minutes, add 1 tbsp of oil and knead for another 5 minutes. Add another 1/2 tsp of oil to the dough. Cover the dough and keep it to rise double in size. Apply oil on the palm, punch the dough and knead the dough on a flat surface for 2 minutes. 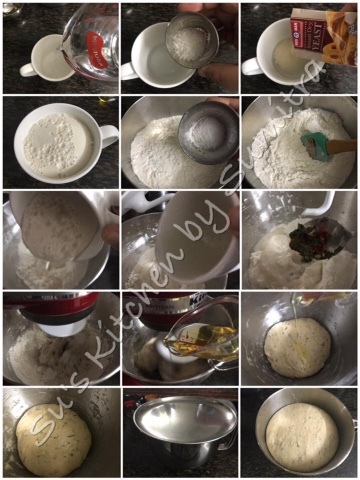 Divide the dough into equal portions depending upon the size you want. I weigh the dough as it will be of the same size. Take a rectangular baking tray. Grease it with oil. 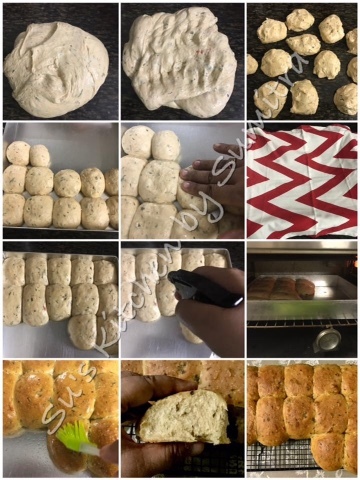 Roll the dough and place it on the baking tray. The dough should be touching each other. Apply oil on your fingers and gently flatten the dough from top. Cover the dough and let it rise double in size. Spray water on the dough. Bake at 190 degrees celsius for 20 minutes or till brown in colour. Remove it from the oven. Brush the pav with butter. Let it cool completely before eating it. 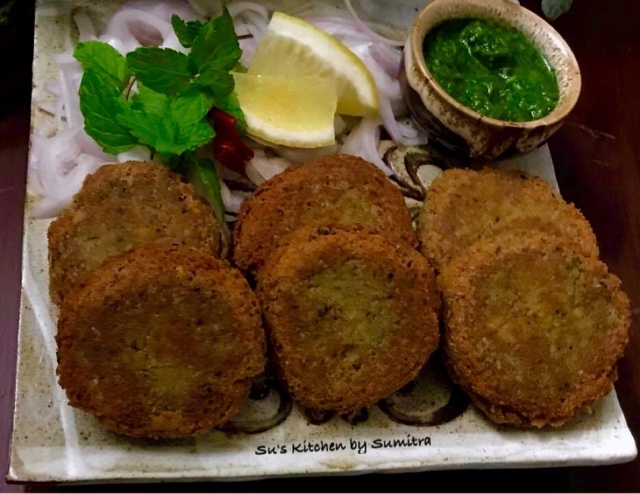 Shami kebabs are popularly eaten as snack or appetizer throughout India, Bangladesh and Pakistan. It is made from beef, chicken or lamb. 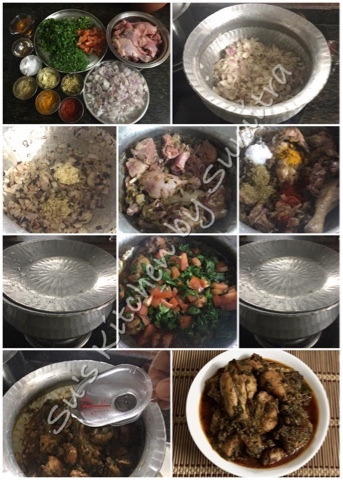 It is made by boiling the meat,dal, whole spices, onion, ginger and garlic, salt and turmeric powder till the meat has cooked. Then it is ground into a smooth paste. Coriander leaves, mint leaves and green chillies are added to the paste. It's given a shape of a patti and it's shallow fried in oil. It's garnished with onion,lime and mint leaves. It is served with green chutney made out of coriander and mint leaves. Take a pressure cooker, add the mutton pieces, chana dal, onions, garlic, ginger, coriander seeds, cumin seeds, cinnamon, black cardomom, green cardomom, Cloves, pepper, salt, turmeric powder and 1 1/2 cup water into the pressure cooker. Close the lid and let it whistle 4 times or till the mutton has cooked. Let the pressure release, open the cooker and if any water is remaining, dry it up. Let it cool down completely. Then add the meat and the dal into a food processor, add egg and blend it until it turns into a smooth paste. Add the coriander leaves, mint leaves and green chillies. Add salt and chillies if required. Blend it once more. Take a tray, grease the tray with oil. Apply oil on your palm. Take a lime size ball from the mixture. Roll it and flatten it a bit. Place it on the tray. Keep it in the refrigerator for 15 minutes. Take a fry pan. Add oil. Shallow fry the kababs very gently till golden brown on both the sides. Remove them on a paper towel. Serve them hot with green chutney, onions, lime and mint leaves. 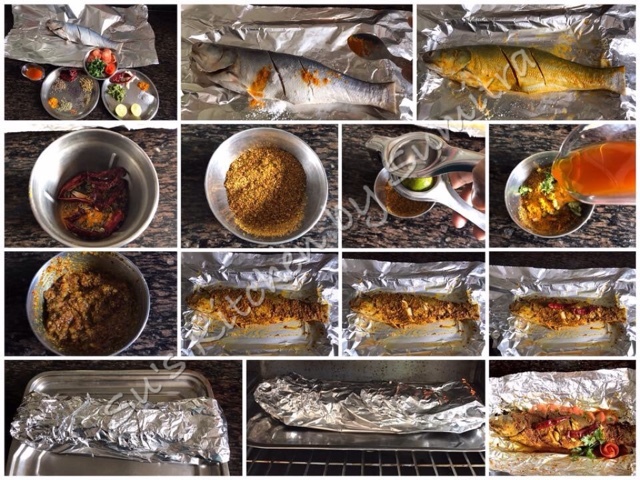 This is a fish preparation, very easy to make, spicy and scrumptious. You can serve this dish as a starter or have it as a side dish with hot steaming rice. 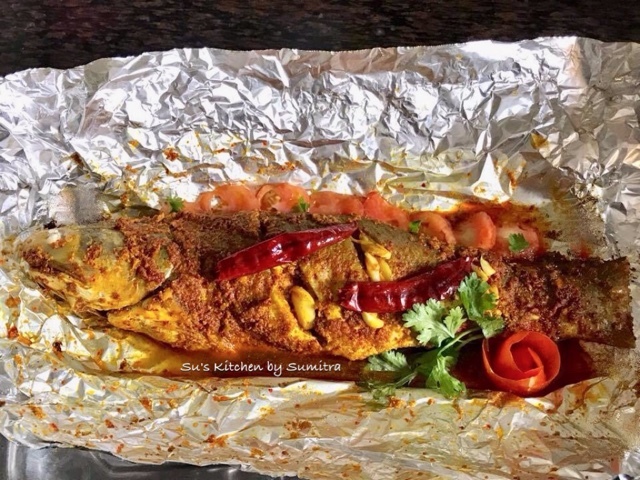 The fish is marinated in fresh homemade achari masala. We all have left over oil from the pickle, and we discard them, but I use it up in creating other dishes, so here I have used achari oil from the pickle which gives extra punch to the dish. Clean the fish well, the fish has to remain in 1 piece. Give 3 slits on the fish. Keep the fish on a foil paper. Apply salt and 1tsp turmeric powder on the fish and keep it aside for 10 minutes. 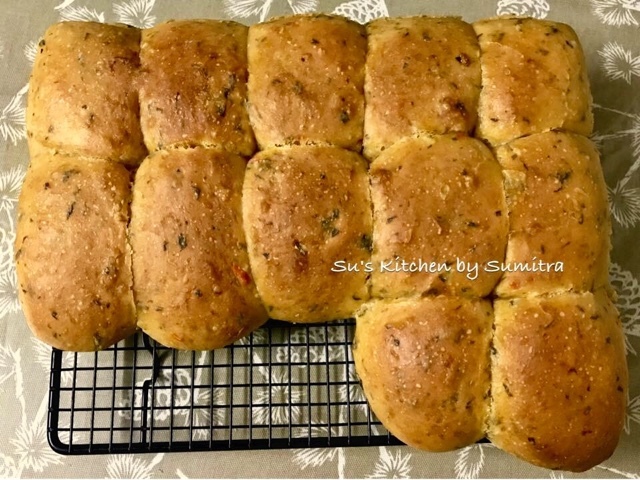 Meanwhile add mustard seeds, coriander seed, cumin seeds, fennel seeds, carom seeds, fenugreek seeds 1/2 tsp turmeric powder and 4 red chillies into a grinder and grind the seeds into a powder. That makes our achari powder. 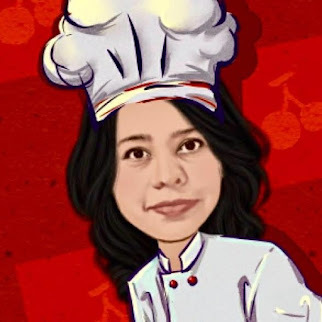 In a small mixing bowl add the achari powder, lime juice, garlic - chilli paste and oil, mix it and let it stand for 5 minutes, apply the achari paste properly all over the fish, push the crushed garlic into the cuts of the fish and add 2 dry chillies. Cover the fish with the foil paper. Leave it to marinate for 30 minutes to an hour. Steam the fish in a preheated oven for 20 minutes at 200 degrees celsius or you can steam it in a steamer till the fish is cooked. Garnish it with coriander leaves and tomato. Serve it hot.